Simplified Schematic of Blowback Mechanism With Ad vanced Primer Ignition. is arranged to ignite the primer of the fresh cartridge just before the bolt reaches its fully forward position. Although the details of an actual gun of this ivpc may be considerably different in form from the schematic representation shown in fig. 1 -20, the basic mcchanism shown illustrates the essential mechanical function. The fundamental parts of the mechanism are the bolt (which backs up the cartridge ease and is free to slide in the breech casing) and the driving spring (which absorbs the kinetic energy of the bolt when the bolt is blown back and then drives the bolt back to the firing position). The cycle starts with the bolt scared to the rear and with the driving spring compressed. When the scar is released, the bolt is thrust forward by the driving spring and as it moves forward, the bolt picks up a fresh cartridge from the feed mechanism and carries this cartridge into the chamber. 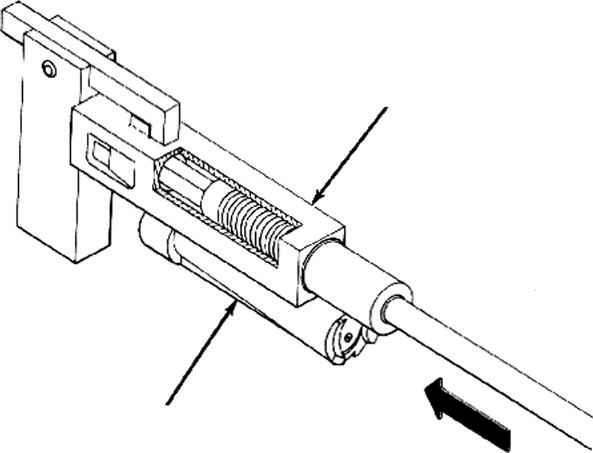 When the cartridge has entered the chamber sufficiently that the case walls arc adequately supported but before the bolt has reached its fully forward position, the firing device is actuated to ignite the primer. The pressure resulting from the explosion of the propellant charge drives the projectile through the barrel of the gun and at the same time immediately exerts a force which acts through the base of the cartridge case to slow down the forward motion of the bolt, bring the bolt to a stop, and then propel the bolt to the rear. At the time the bolt is driven to the rear, the only significant resistance to the acceleration of the bolt is clue to the inertia of the bolt mass. The force exerted by the pressure of the powder gases lasts for only about 0.008 or 0.009 second after ignition of the primer. After this point, there is no further force driving the bolt to the rear but the recoiling parts continue to move of their own momentum. As the bolt moves back, the spent cartridge case is extracted from the chamber and ejected. The resistance of the driving spring gradually slows the bolt down until it has rcduced the bolt velocity to zero. At this point, the rvcle of operation is complete and a new cycle begins as the energy stored in the driving spring starts the bolt moving forward. The most important factor to be considered in analyzing the eflects of using advanced primer ignition is the manner in which the energy of the returning bolt is utilized. Tf the relatively small losses to friction and to operating the mechanism are ignored, the driving spring will return the bolt with a final velocity which is almost equal to the initial velocity of recoil. The amount of impulse which must be supplied by the propellant explosion to stop the forward motion of the bolt will then be approximately equal to the amount of impulse required to produce the initial recoil velocity, or in other words, only about one-half the impulse produced by the explosion is effective in causing the rccoil velocity. Therefore, when advanced primer ignition is employed, the momentum imparted to the bolt is only one-half of that which would be obtained with plain blowback. This means that from this standpoint alone, the bolt weight can be reduced by a factor of two. 1. If no lubrication is provided, the peak chamber pressures will cause the cartridge case to seize in the chamber and therefore separation of the ease will occur unless the bolt movement is limited so that the elongation of the case material is not exceeded while the case is stuck. As explained in the analysis of plain blowback, the precise elongation permissible for a specific cartridge case can be determined only by careful experimentation under actual firing conditions, but a good rule to follow for the brass cases of 20-mm rounds is that the bolt movement to the rear should not exceed 0.015 inch during the first 0.0015 second of the propellant explosion. With advanced primer ignition, the first 0.0009 second (approximately) of the explosion is utilized to stop the forward motion of the bolt so that the critical time during which case separation can occur endures for only 0.0006 second. Sincc a bolt r movement of 0.015 inch is permissible during this time, the average allowable bolt velocity for the same time, is 25 inches per second, or about 2 feet per second. This is twice as great as the velocity permissible with plain blowback but is still a very low value. 2. If the ammunition is lubricated in order to avoid chamber seizure, ease separation will not occur but the motion of the bolt must still be limited to prevent the ease from moving so far out of the chamber that the thin walls near the lia.se arc unsupported while there is any considerable residual powder gas pressure. As for plain blow-back, this means that for a case of the type shown in fig. 1-6A, the travel in the first 0.010 sccond of the propellant explosion should not exceed 0.250 inch. Sincc the rearward motion does not start until 0.0009 second has elapsed, this movement will occur in 0.0091 sccond and therefore the allowable average velocity is only 27.3 inches per sccond, or at the most 2.5 feet per sccond (instead of 2 feet per second as is allowable with plain blowback). great with the type of ammunition shown in fig. 1 6A. The increase in permissible bolt velocity will producc a somewhat greater rate of fire and will also result in a further decrease in the bolt weight necessary. This saving in bolt weight, coupled with the fact that the bolt weight is reduccd by a factor of two because only one-half the explosive impulse is effective in producing recoil, will give a total weight reduction factor of somewhere between 2 and 2.5. In other words, instead of the 500-pound bolt required for the 20-mm gun used as an example in the analysis of plain blowback, the- bolt weight for a 20-mm blowback gun with advanced primer ignition would be somewhat over 200 pounds. Although this represents a great improvement. over plain blowback, a gun having such a heavy bolt would still not be practical, particularly sincc the rate of fire will not be much greater than the 48-round-per-minute rate attainable with the plain blowback gun used as an example.